Looking for some Azores Tea on your next trip to the islands? You might be surprised to learn that there are two tea plantations right in Sao Miguel. I am told that these are the only commercial tea plantations in all of Europe. I know that both are worth a visit if you enjoy a cup of tea. Or if you like to learn about the history of the economy and industry of an area. Even if you don't like tea or a bit of history, both sites are beautifully situated and well worth visiting. Both tea plantations are on the North Coast, right along the highway. 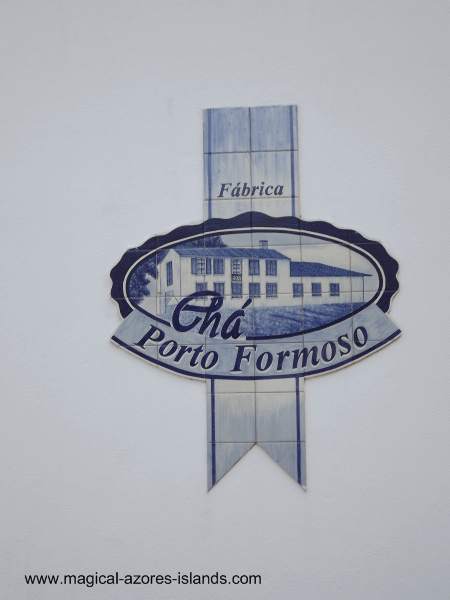 The first is Cha Porto Formoso, the second is Cha Gorreana. The latter was established in 1883 and the tea is still produced as it was 125 years ago. Both establishments offer the opportunity for a tour, tasting, and purchase of their teas. Both are quite proud of their respective histories. There are some beautiful ceramics at Cha Porto Formoso, like this water fountain. The next two images show a part of the lovely Tea room and gift shop. Followed by a couple of pictures of the old equipment. Cha Gorreana - More Azores Tea! Gorreana is one of the fourteen original tea producing estates in the Azores. It has been family run for five generations now. The following two images show the building from the road, and then up close from the parking lot. The fields are large and well tended. Mostly they are lined with hydrangeas that show well in the summer. This next image shows some equipment that has been used in the production of tea. And this last image shows the gift shop which is a part of the tea room. There is the opportunity to buy tea as well as some tourism related items like books, souvenirs and post cards.